United Cutlery Undercover Sonic Karambit Black & Sheath | BUDK.com - Knives & Swords At The Lowest Prices! 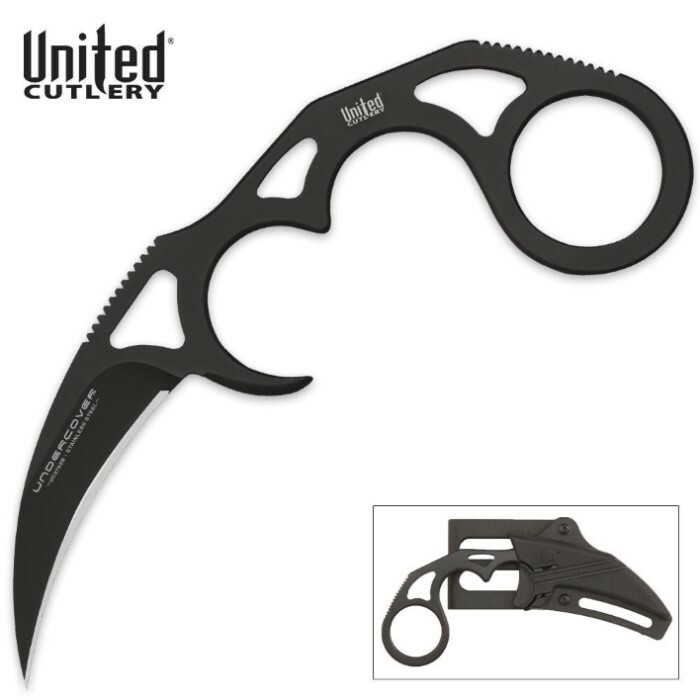 When you need an easily concealed defense weapon, United Cutlery's Undercover Sonic Karambit is your best bet! This blade will go undetected until right when you need it. An everyday carry, this is just a neat little knife. I have the uncoated one. I'll go ahead and tell you, it's factory dull. Had trouble with paracord. That's beyond the point, sharpen it with a hand sharpener and don't complain because this is still a neat little karambit for the price. It is small but covert compared to the bigger ones. The molded sheath allows you to unscrew the loop portion and turn around so it rides very high on your belt for more concealment. I really like this item and bet you will too. this is a Great little knife. sharp out of the box. very easy to conceal and deploy. good value for the money. I'll be buying another one as a gift. been a BudK buyer for many years and will no doubt continue to be a loyal customer. Thanks BudK and keep up the good work. This is a nice knife, it's pretty cool. The sheath is nice and slim but the belt loop is a joke, it's so small, it wouldn't fit around any of my belts, I'll need to make some adjustments for it to wearable. This knife is great for the price but it is tiny. It's very easy to conceal and makes a great EDC. It comes sharp out of the box. Overall a great little knife. Thanks budk! Although it's small, it's a great little knife! I actually own two of these and 2 larger ones. The smaller ones are perfect for everyday carry, I find them to be more useful than the regular folding knife I used to carry. There is a learning curve, but if you love the usefulness of a kerambit this is the perfect EDC. It's sharp right out of the box and not obnoxious on your belt like others can be. Great multipurpose utility knife or defensive blade. Overall a good buy.The multi position sheath allows you a few options on how to carry the knife.It is easily concealed and very light on your belt and comfortable to wear. The blade and point are sharp and ready to go out the box. The only down side is that with it being a small piece it does favour a smaller hand. 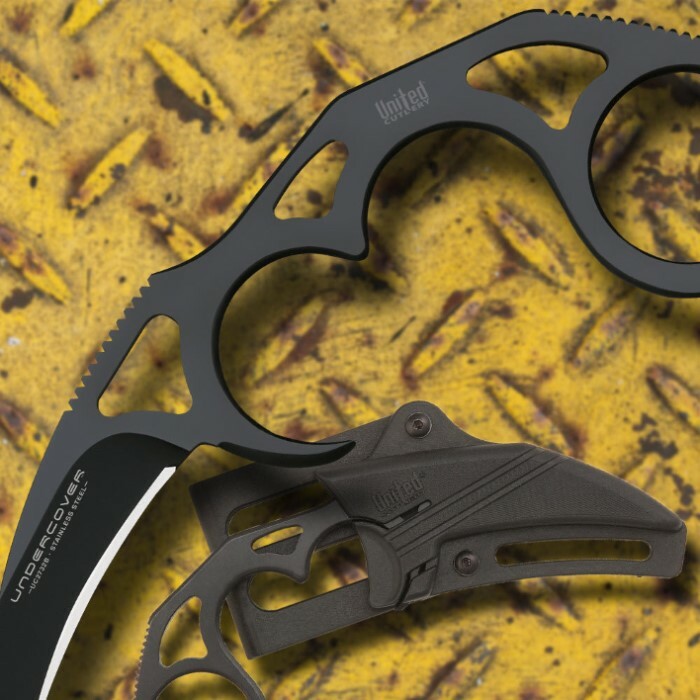 However with a bit of practice and bearing in mind if it was ever necessary to bring this blade into play in a real life situation, your fingers will very quickly find a way to wield the Kerambit. Love it. Small, sturdy, well made. I also love the sheath minus that its mean for your belt. Very quality product for such a low price. Seems pretty sharp out of the box, not just the tip either. Feels really good in my hand top blade up.